When our first child was born in 2003, we were in a comfortable financial situation—no debt, healthy monthly cash flow, and a cushy emergency fund/savings account. I had always wanted to be home full-time with my kids, eventually pursuing part-time freelance writing work. It all seemed more than manageable. We were fine living on my husband’s salary and my meager few thousand dollars a year. That was until the twins were born in 2005. I don’t have to tell you that with twins, everything is double: more diapers, more onesies, more gear. We had tons of help (with finances and resources), but we quickly blew through our stash of cash and (unfortunately) piled on the credit card debt. We’ve been digging out of that the last few years, as we’ve both increased our incomes. But now, we’re facing the preteen/teen years with out-of-control appetites, $100 athletic shoes, and orthodontics. I find these numbers interesting. If I’m interpreting them correctly, there’s a whole lot of working moms working full-time who would prefer to be working part-time. I’m here to tell you that it can happen for you. I wholeheartedly believe that when you tap into your God-given passions, your priorities will come into focus. As you work your priorities, the provision appears. It’s not hard to get started in your pursuit of the opportunity that you can turn into a successful home-based business. I’ll let you in on a little secret: God has left clues for you everywhere. Just look around! What has God placed in your heart that motivates you? What do you love to do? How has he already given you the skills, passions, objects, and equipment to move forward to follow his call? Maybe you love children and find them running in and out of your house all summer long. What about beginning a day camp or starting a kids’ birthday party business? Maybe you have a great eye and love taking photos. Take a few classes and offer family photo sessions initially for low cost or free in exchange for the experience, referrals, and to build your portfolio. Are you unhappy with your work situation? Would you like to have your own money-making business but aren’t sure how to begin? Start by looking in your house because there you will find your passions, priorities, and provision. 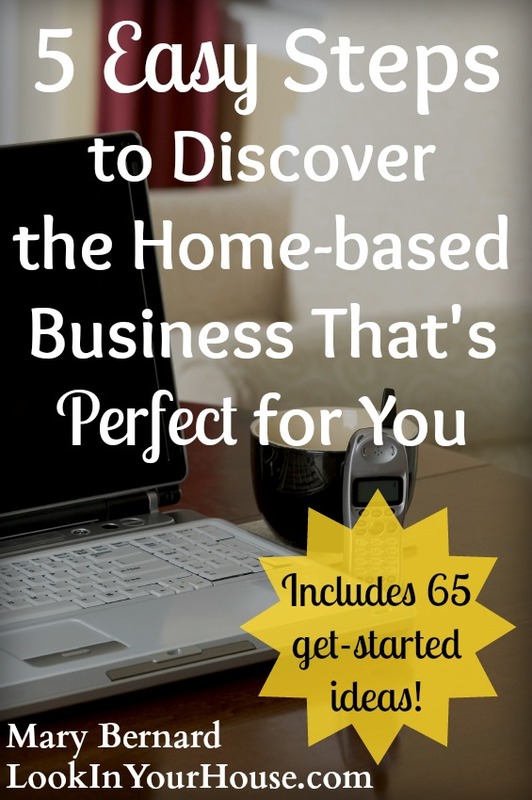 If you want to know more about discovering a home-based business that’s perfect for you, download my free ebook that walks you through the process and offers you 65 business ideas you can start right away! Please note: this blog features affiliate links. Should you make a purchase using my link, I will receive a small commission in exchange for my referral. Mary Bernard is a Nashville-based writer and mother of three. She's worked in a variety of corporate and creative environments, but none is more comfortable than the dining room table in her own home. Mary loves to help moms discover God's unique call to look in their own houses for their priorities, passions, and provision.